Some hotels strive hard to be known for having the biggest pools, highest bars, tallest tower, etc. And while these record-holding titles do make the headline in the travel and hospitality area, I find that what I remember and cherish the most are the little touches that you discover in your room. From popcorn makers to guitar heroes, here’s a list of the top 10 coolest things I’ve found in various hotel stays. When I enter a hotel room for the first time, I usually like checking out the bathroom first. Because I love taking my time in there when I’m in hotels. It’s all part of the relaxing process 🙂 I love checking what toiletries they have. And it was a pleasant surprise when I opened that heavy ceramic container. My own perfume / hair oil. It had a musky, oriental scent (which I normally gravitate to on perfumes). It’s great as an oil perfume, but I wouldn’t suggest using it as a hair oil. Its abit too slick. Though I never really used it, this just made me want to be 10-13 years old again. 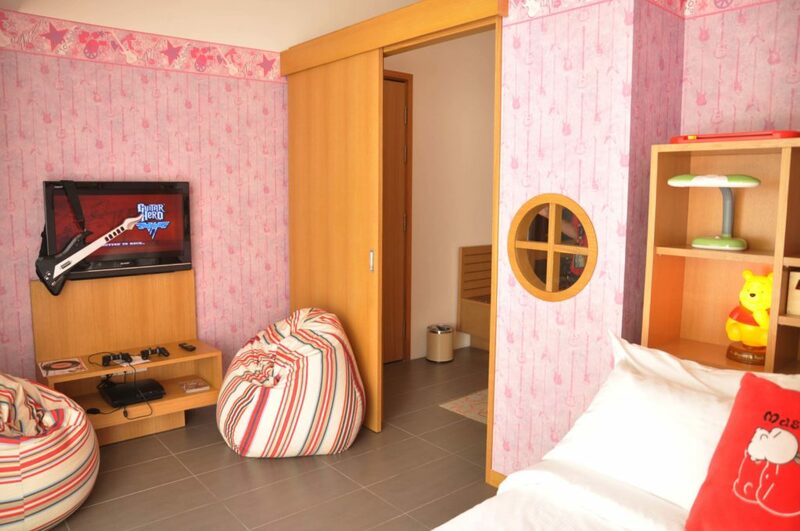 And this room, btw is adjacent to the master hotel bedroom, which is naturally where the parents will stay. While there could be a great debate about this (indulging kids with video games while travelling) and while I would love to talk about that at a length, we can save that for another day. I don’t drink coffee so fancy Nespresso machines don’t really do it for me. 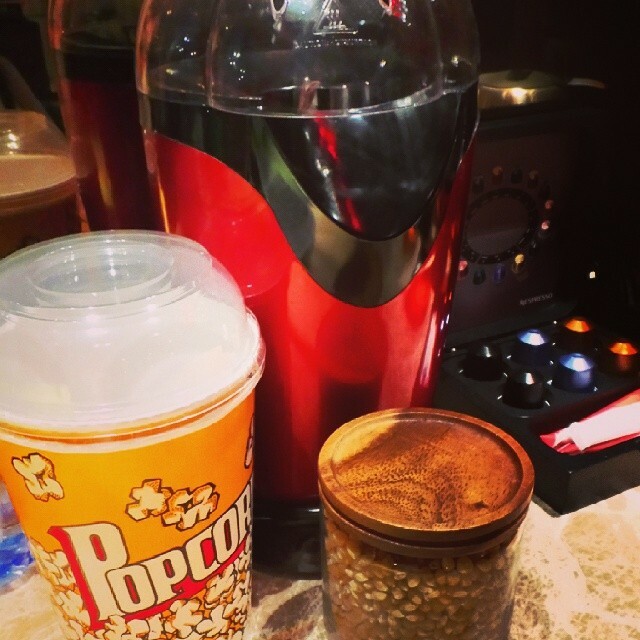 So when I checked in at the overwater studio in NIYAMA Maldives and saw, lo and behold– a popcorn maker (complete with disposable movie theatre-style containers), I was ecstatic. I love munching into something while working or watching movies (which I do at hotel stays), so having this around was awesome. The kernels were refilled everyday too. Yup, found in the same hotel/resort, and in the same room too. And we’re not just talking about a handful of free movies here. This is a plethora of movie collection. Let’s just say it took me longer to choose which movie to watch than actually watching the movie (I didn’t finish it as I needed to sleep). Numbers 4 and 5 kind of make me confused. Like first-world-rotten-spoiled-cow annoying confused. Because for the first time, I was torn whether to stay in the room and enjoy the popcorn and entertainment (it also had a twice as huge music collection) , or to go out and play in the Indian Ocean. We actually got a his and hers freebie in this room. Zombie’s was a shirt. 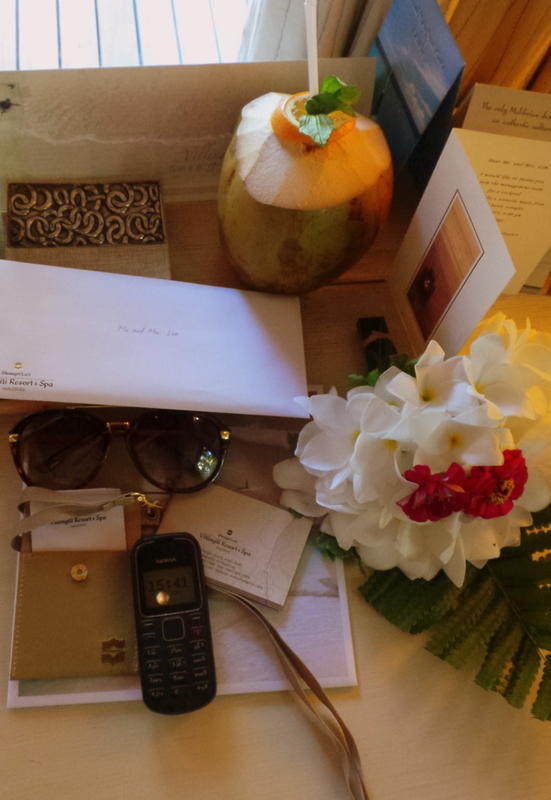 And while Sofitel Bora-Bora isn’t the first resort to offer your personal cover-up/sarong/pareo, it was definitely the first to have that personalised service. When we checked in the lady who accompanied us actually took the time to show and demonstrate to me the various ways you can wear it. I love personal touches like this! Other resorts I’ve been to will just have the sarong neatly laid on the bed, for you to assume that perhaps its yours to use. The Goring Hotel in London is known for being the place where Catherine “Kate” the Duchess of Cambridge spent her last night as a single woman. 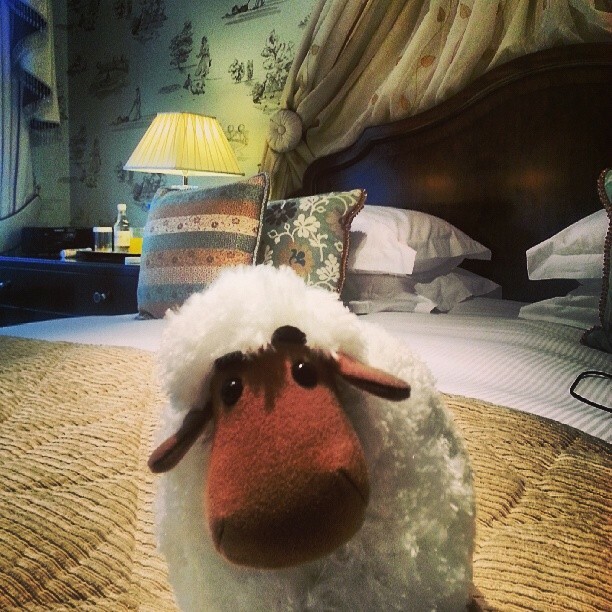 It also has a very proper and classic old English style of luxury, so it was quite a pleasant surprise to see this adorable stuffed little sheep (with the face of a moose and lopsided eyebrows) in the bed. It’s common for most hotels to have stuffed animals or hotel characters/mascots in the bed but I haven’t seen anything as adorable as this one though. A mobile phone with direct access to your thakuru’s (butler) number. The Shangri-la Maldives is huge and sprawling. So they thought it practical for guests to carry their own mobile phones around. And ok, I agree the phone is very 90’s and early 2000’s but you’d need a small one to carry around the resort anyway. The Hotel in Brussels is probably the most fashionable hotel I’d ever stayed at. 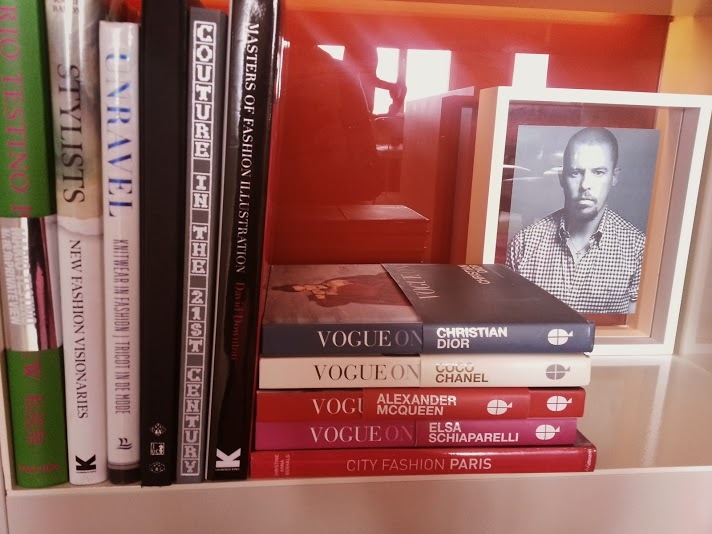 So while it was no surprise that they had FTV (Fashion TV) Channel , it was great to discover these books (and more) in the rooms and in most common areas. 10.) THE BEST COOKIES IN THE WORLD. 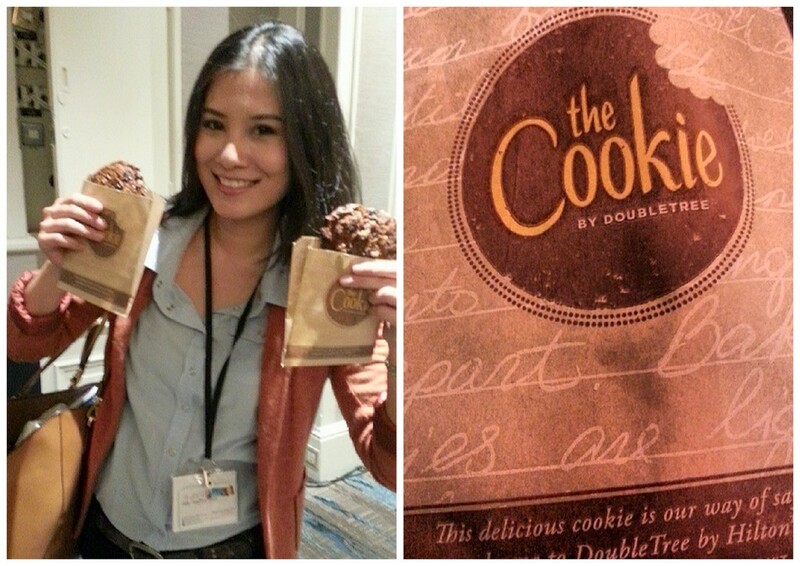 The Cookie by Doubletree Hilton . No words. Forget Mrs Fields, Famous Amos or those designer cookie shots. THIS is the absolute best cookie in the entire universe. Made fresh on-location at ALL Doubletree by Hilton Hotels worldwide. I know that people (including me) will consciously book or choose this hotel because of the cookies alone. You unfortunately cannot buy them. You must be checked in at the hotel, or at least have an event there, such as when I attended TBEX ’13 held at the Doubletree in Dublin. In between sessions and talks, a huge tray of cookies would come out in the afternoon. I did some “cookie quality check” service for the rest of the attendees by strategically positioning myself near the entry/exit path. And years and years ago, back in my flying days, the Doubletree by Hilton in Seattle Tacoma was our layover hotel. 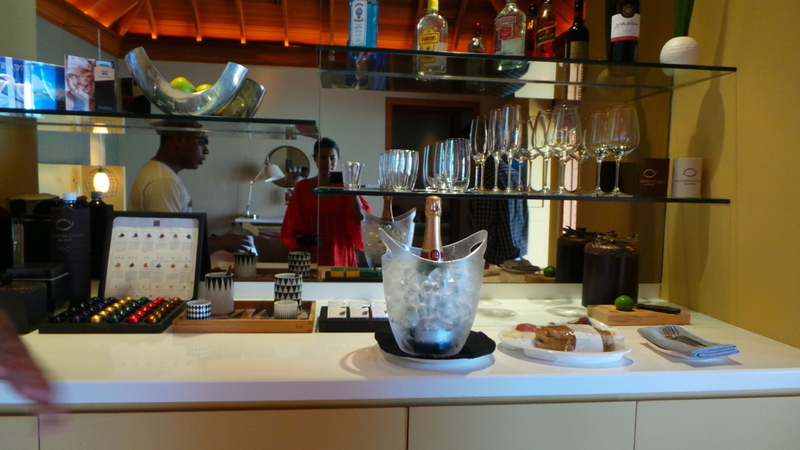 This was my first experience with Doubletree by Hilton. They gave the cookies right after you check-in, or when you happen to pass by the front desk. I purposely (in the middle of Seattle winter), wandered in and out of the hotel lobby and facade just to have more than one of these cookies! What a loser..for cookies! Those da**ed cookies have made a shameful cookie monster out of me. But that says so much about how good they really are. So there goes my top 10 list for now. I’m sure this list will grow as I keep discovering other hotels. What’s the most interesting hotel room amenity that you have seen? Oh what cool stuff, I’d be so delighted to see a movie collection… and 20 teas… if there were larger cups too. Tiny tea cups are the bane of my life, I take my own usually. The best we found recently were the lip balm and sunscreen provided in the very luxurious bathrooms of the Jumeirah Beach Hotel in Dubai – just what we needed at that time, esp the lip balm. The Versace branded toiletries would be amazing for sure! 🙂 Did they include perfume? Those little goodies and freebies are definitely one of the perks of staying in hotels. Oh yeah – FOC perfume was the best!!! OMG POPCORN! I’d honestly be in heaven if I had that. I’m currently in bed at a Doubltree, I’ve been here for only two days and already consumed three of their cookies, they are SOOOO good, and warm, and gooey, YUM! Holy…smithereens ! I’m super envious of you right now! Oh those cookies!!! gosh i can just imagine! 🙂 Please have more for the rest of us! What a great article, I really believe it’s the small details that makes a hotel stay stand out. I think my favourite is the sheep, so cute! Yes the small details are what we remember the most as its more personal. I couldn’t resist that forlorn look on the sheep too 🙂 adorable. Wonderful finds from some great destinations too. I dare say the movie and music collection comes in handy if there are any torrential storms. I must admit that I don’t stay anywhere quite as plush as this. If I do find nice toiletries, (anything by Bath & Beyond is a big plus from me. Better than that then it is real good.) also cookies in Hampton Inns. I guess cookies are in most Hilton chain hotels? Is there anything in particular to make the Doubletree ones so special? Ahhhhhhh…. Guitar Hero, seriously, thats amazing. And the moby phone with your butlers digits, also super cool. These are some seriously great ideas, I am gonna forward your post to the hotel across the road from my work, Im pretty sure they’d be keen to introduce a couple of these ideas. 🙂 Very awesome post, Im going to pay a lot more attention to the mini bar in the future. Great post! Looks like you’ve been some beautiful places that wow their guests with something special! Hi Holy, I came across ur site when looking for reviews for maldives’ shangri la. we’re heading there in a few weeks time. Your review is awesome for us since we’re booking everything by ourselves. I think one of the most practical item i am happy to see in my hotel room is an umbrella. especially since it tends to rain in Asia. 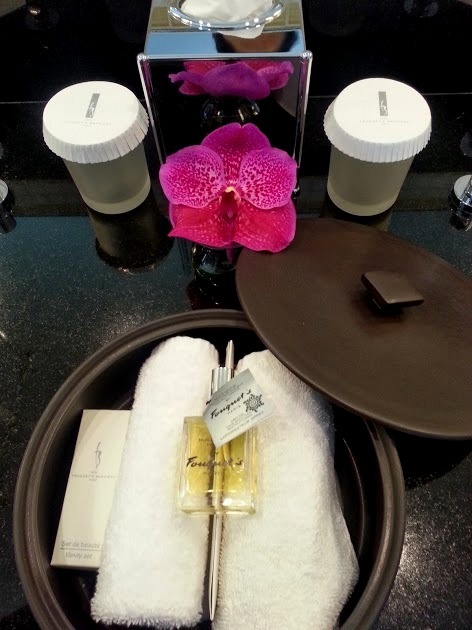 Hilton KL Sentral provides facial cleanser which i love. I’m now torn to cancel my reservation with Hilton KL and change to Doubletree just for the cookies! should i?? Hi Raihan, how exciting you’ll be in the Maldives soon. You won’t be disappointed with the Shangri-la for sure 🙂 Yes, an umbrella is always handy! I’ve first seen it in Dublin where it was really needed. A facial cleanser! I haven’t encountered that yet 🙂 As for your situation..Hilton vs Doubletree hahaha well they are both hilton properties I’d probably stay at the Hilton and swing by the Doubletree for the cookie! Really cool rooms, very inspiring!